"You still can't beat Yuki, now can you loser?" The above info came from Angie, and was edited by yours truly (contact me). The image came from Haru Sohma. 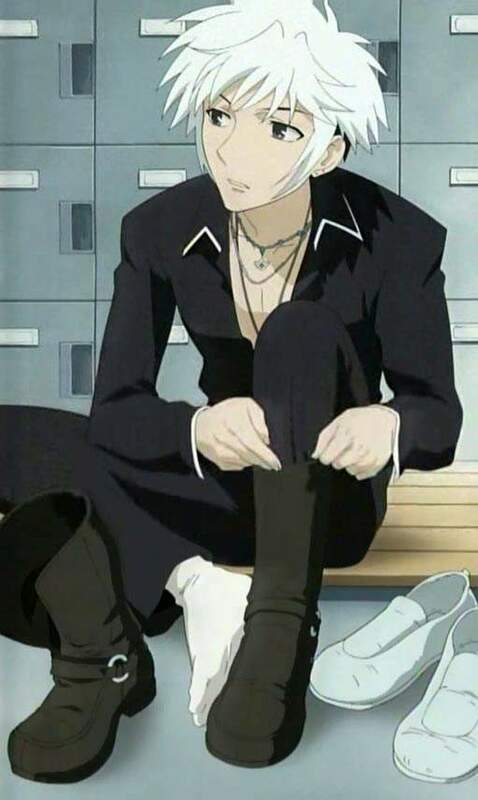 Hatsuharu Sohma is one of the most interesting characters in Fruits Basket . Whenever he embraces a person of the opposite gender, he turns into a cow. Haru has developed a split personality. The good side of him is "White Haru", the calmer, kinder, lazier, and less arrogant side. The bad side is "Black Haru", who is arrogant, rude, and rather violent. Even the smallest problem can trigger his black personality. This all started when he was little. He held a grudge against Yuki. People in his family always made fun of him about how the cow was stupid and let the rat used him. This made him mad, so mad that he developed a black personality. He soon had forgiven Yuki after he got to know him. Haru is mostly seen wearing rockish attire, like biker clothes. Sadly, he only rides a bicycle because he's not old enough to ride a motorcycle. In both the anime and manga, Haru is bisexual, as Haru does indeed like Yuki. He explained that to Tohru when Yuki got sick, stating that Yuki was "His first love." However, in the manga, he does have a thing for Rin and they did date for a while until the thing that happened... happened. Haru actually loves Isuzu "Rin" Sohma. Though to protect him, she breaks up with him. She is trying to protect him from Akito (who is eventually revealed to be female in the manga) because Akito already put Rin into the hospital so she is worried that Akito will put Haru there too. Though Rin breaks up with Haru, she is still very much in love with him as he is with her. I am pretty sure that Miu Sohma likes Haru, but obviously since he's in a relationship (kind of) with Rin... It can't really be possible. Editor's Note: I'm told that in the third volume of the manga, when Yuki introduces Hatsuharu, Yuki says "he's a year younger than we are; he's a third year in middle school". In the American school system, this would mean that he would 12-13 years old, but in the Japanese school system this would make him 14-15 years old, with 15 being the more likely age. The above description came from Angie, and was edited by yours truly (contact me).